Tamil Nadu Transport Unions Rolled Their Sleeves Up For Strike. Tamil Nadu Transport Unions had announced an indefinite strike from mid night. Most of the buses across Tamil Nadu are still parked in depots. Even though some government buses are in active Private Transports are dominating today. Behalf of the strike private transportation and autos are charging higher fare in many cities. 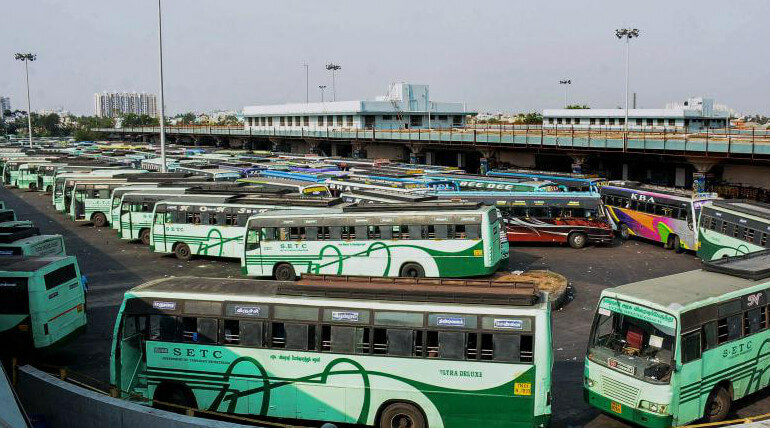 According to the Tamil Nadu Transport Unions the strike was due to the non co-operation of the government. Transport Corporations are seeking salary hike up to 2.57% compared to other states. But Transport Minister M.R. Vijayabaskar said government is ready to hike up to 2.44%. This Variation on percentage made transport workers to start the indefinite strike without any formal notification. Some of the transport union buses had left their passengers in half way and stopped the buses. This action of transport workers made the situation of the passengers worse. And in some places passengers are hassled with transport workers. Due to the indefinite strike schools and college students are facing more problems. Transport Unions said we don't take any responsibility for the inconvenience happened for the public until government considers it as a serious problem. And they won't take back the strike till their demands are accepted. Meanwhile Transport Minister M.R.Vijayabaskar said if Government accepted their demand for the hike about 2.57% government will face up to 84 crores of extra expenses. Some Unions like Anna Thozhir Sangam had accepted government's opinion but some unions are making politics against us and asked the transport unions to get back to their work. He also said all buses will be on road by the evening.